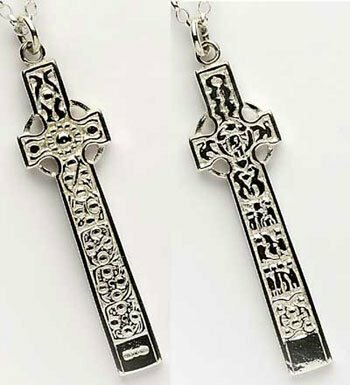 Beautiful Celtic Cross Pendant handmade in sterling silver or gold faithfully captures all authentic detail of the original Celtic high cross of St. Martin found on the holy island of Iona. 44mm high and 11mm wide. 6.4g silver weight. 7g gold weight. With 18″ diamond-cut belcher chain. 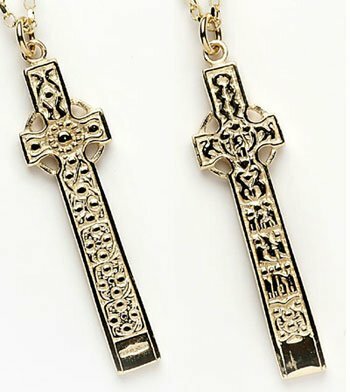 Celtic Cross of Saint Martin of Iona recreated in beautiful detail. Handmade and hallmarked in Ireland. We know a great deal about the life of St.Columba. He went to Iona in 563.
to Iona, which was now his home, and died there in 597. Columban monasteries in Ireland, is dedicated to this French saint. monastic settlement would have appealed to them as a man to be admired and venerated.